My son's kindergarten teacher sent me this little activity. I did not make it, but I did find it on another blog you can check out too: silken-did you know (the picture below is from that site). Cut the slice of bread in half diagonally. Make your sandwich as usual--I would probably make peanut butter and jelly--but that's just me. 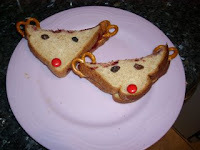 Then on the outside of the bread add 2 raisins for eyes, an M&M for the nose, and pretzels for the antlers. I was thinking, if you would just like to use the bread without making it into a sandwich, you can cut the bread in half, then paint it with some brown food coloring. After you paint the bread you would add the eyes, nose and antlers.